Along with the new Bay Trail T line announced at IDF, Intel also introduced the Bay Trail M and D lines of processors, and paved the way for cheaper PCs. The Bay Trail M series is intended for convertibles and notebooks. It includes the Intel Pentium N3510, and Intel Celeron N2910, N2810 and N2805. Though slightly larger than the SoCs in the T series, these new Pentium and Celeron chips offer similarly improved performance (up to 2x CPU and 3x GPU) but generate low amounts of heat and can be incorporated into fanless systems. Intel suggests that products built around these new chips can be less than 11 mm thick (0.43 inches) and weigh as little as 2.2 pounds, with prices starting at US$199 for notebooks and US$349 for convertibles. The Bay Trail D series is intended for entry-level desktop systems and all-in-ones. The line includes the Intel Pentium J2850, Intel Celeron J1850 and Intel Celeron J1750. These new processors are Intel's smallest ever for desktops but also offer up to 3x improved performance and can be used in fanless systems. 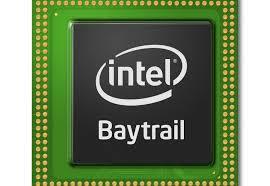 Prices for new desktops using Bay Trail D chips should start at US$199. Bay Trail M and D SoCs are expected to start shipping to OEMs (including AAVA, Acer, ASUS, Dell, Lenovo, and Toshiba) in Q4 of this year.